Share first opened in 1986, part of a national network of Shares dedicated to expanding community access to wholesome, affordable food. Since that time, Share has evolved into a vibrant, high-impact organization, recognized for our strong leadership role in reducing regional hunger and expanding access to nutritious, affordable food. In the early days, Philadelphia Share was primarily a community food coop, offering below-retail packages of food in exchange for two hours of volunteerism and a modest payment. As food poverty affected more families in our region, Share stepped forward. 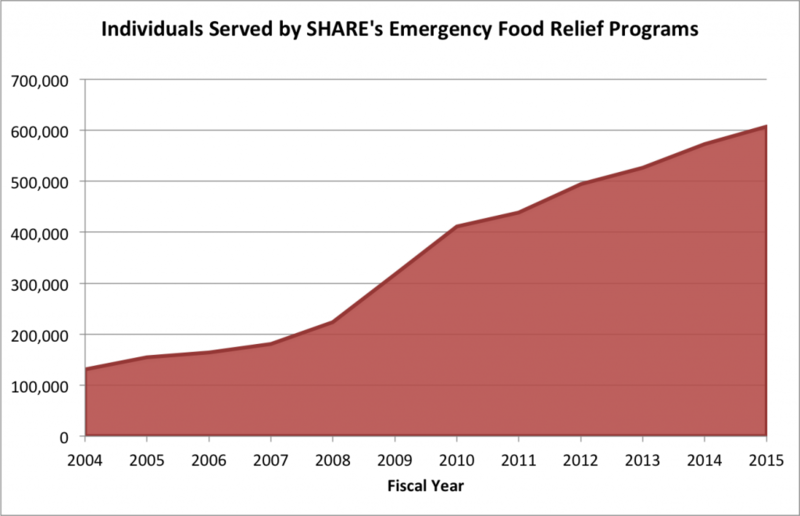 Share became an independent 501(c)(3) nonprofit in 1991, with the mission to “serve a regional network of community organizations engaged in food distribution, education and advocacy.” That year, Share became the lead agency in Philadelphia County for the State Food Purchase Program and The Emergency Food Assistance Program. Last year, Share brought 27 million pounds of emergency food relief to low-income Philadelphia residents facing hunger. Each day, Share manages complex food distribution operations, to bring a steady, reliable stream of food relief to more than 505 volunteer-led food cupboards. The need has escalated, as illustrated by the graph below. Without Share, local food cupboards cannot meet the growing need. Each day, impoverished Philadelphia families struggle to put food on the table, and the need continues to rise. According to the Philadelphia Inquirer, the City’s “deep poverty” rate – families living at less than half the poverty rate – is twice the U.S. average. Share serves our region’s most vulnerable citizens: 700,000 low-income individuals each month – of whom 36% are children and 12% elderly. Share is committed to ensuring that NO hungry individual or family is turned away from a food cupboard. We need your help to meet the growing need. Many cupboards have food shortages at the end of the month, and rely on Share to make sure every family can eat wholesome food. Your help will purchase needed food supplies, and ensure rapid distribution to our network of food cupboards. Government grants do NOT support the costs of unloading, storing and transporting millions of pounds of food each year. Without your help, Share cannot deliver needed food to local cupboards. Share can ONLY respond to growing need with your support.